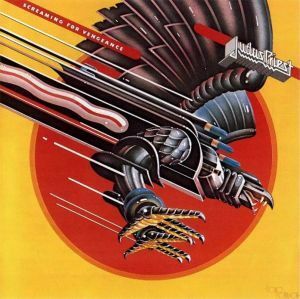 Screaming for Vengeance is the eighth studio album by British heavy metal band Judas Priest. It was recorded at Ibiza Sound Studios, Ibiza, Spain and mixed at Beejay Recording Studios and Bayshore Recording Studios in Coconut Grove, Florida. It was first released on 17 July 1982. A remastered CD was released in May 2001. "From an unknown land and through distant skies came a winged warrior. Nothing remained sacred, no one was safe from the Hellion as it uttered its battle cry...Screaming for Vengeance." The album reached No. 11 in the UK and No. 17 on Billboard 200 Pop Albums and made Judas Priest much more popular than they were after their British Steel album. It went gold (RIAA) on 29 October 1982, platinum on 18 April 1983 and 2x platinum on 16 October 2001, being their first studio album to achieve the two latter awards. This album also includes their hit "You've Got Another Thing Comin'" and one of their most-popular on-stage performances, "Electric Eye". "This is one of two versions of this particular song – the second version having a different chorus. The majority of this track is still as it was put down at the time but with lead breaks from Glenn and K.K. added at a later date. It's very emotional and epitomises the light and shade style of Judas Priest which is the trademark of the band." The album came 15th on IGN's 25 most influential metal albums. Screaming for Vengeance also came 10th on Metal-Rules.com's 100 greatest metal albums. Kerrang! magazine listed the album at No. 46 among the "100 Greatest Heavy Metal Albums of All Time". During the U.S. tour to support the album in 1982, Judas Priest were supported by bands such as Iron Maiden, Krokus, and Uriah Heep (in support of their album Abominog). This album was the first entire album released as downloadable content for the video games Rock Band and Rock Band 2. The title song "Screaming for Vengeance" was played on the main site for the video game Brütal Legend. Rob Halford plays both a villain in the game (named General Lionwhyte) and a heroic character called the Fire Baron.